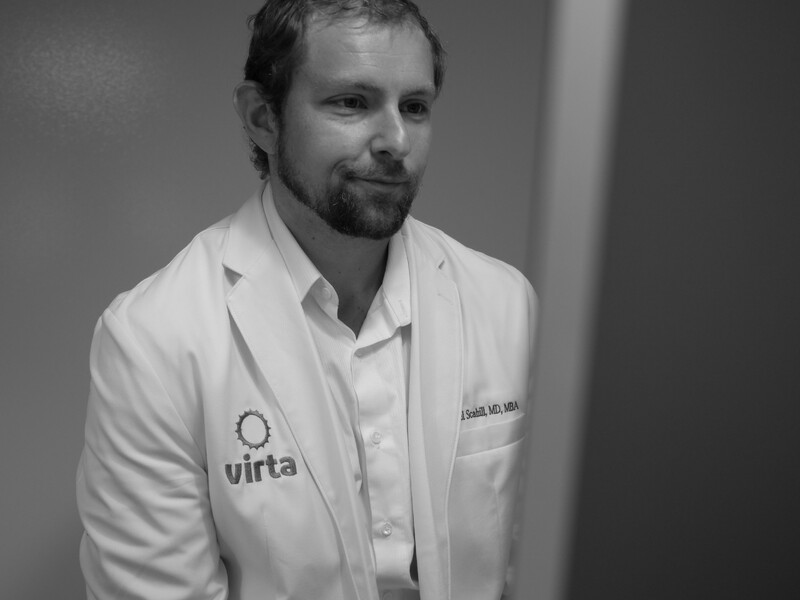 I had the pleasure of interviewing Dr. Michael Scahill, Medical Director at Virta Health. I had the pleasure of interviewing Dr. Michael Scahill, Medical Director at Virta Health. Dr. Scahill is a Fulbright Scholar, a graduate of Stanford’s MD and MBA programs, and, in conjunction with his role at Virta, is a practicing pediatrician in the Stanford NICU. When he is not practicing medicine or helping engineers improve Virta’s continuous remote care platform, Dr. Scahill still finds time to ride his motorcycle and play a match of rugby. My professional life began when, on a total whim, I applied for a Fulbright to India and, despite little to recommend myself for it, was lucky enough to be packing my bags a few months after graduating college. My research there, on an early stage malaria vaccine, was not so fruitful, but the experience was transformative. A few years later, during summer break from Stanford med school, I was in rural Mozambique working on similar research. The sick children I saw there showed me that the way I had been thinking about improving global health was all wrong. That pursuit then led me to business school and, a few lucky twists later, to Virta. When I have the opportunity, I try to have a little fun. At company social events, I take a selfie with everyone in attendance. I sprinkle selfies around the office, and I fixate on random experientialist themes like getting awkward views of our Head of Design in the background or secretly including one of our product managers from as close range as possible without discovery. One time, I was recorded performing the “Alas poor Yorick” speech from Hamlet to a paper & macaroni skull, but that is a bit of a long story. Two things — we have an effective intervention and a transformational way to deliver it. The latter is continuous remote care, which if it is not the gold standard for chronic disease already surely will be soon. Traditional telemedicine was a breakthrough technology some years ago, but replacing the commute and doctor’s waiting room with a computer screen is not reversing anyone’s diabetes. Virta’s model of continuous remote care literally puts world-class nutrition coaching and medical management in our patients’ pockets, available 24/7. The proof is in our results. In our ongoing clinical trial, 60% of patients reverse their diabetes (i.e., getting their HbA1c % below 6.5. All despite major medication reductions (e.g. 94% of trial participants that start on insulin reduce dosage or eliminate usage at one year). Just among the handful patients I treat personally, there are people who’ve come off triple digit daily insulin doses or lost over 60 pounds. In med school, they taught us such cases were about as common hen’s teeth. At Virta, they happen all the time. At Virta, I have been tinkering with the algorithms that help our physicians review and act on patient data more efficiently. I love finding ways to use data to improve patient care (and to pretend I can code like the real engineers). Outside the office, I am setting up a course at Stanford, where I still work part-time, to teach exactly these methods in digital health and machine learning. Hire people smarter than you are and get out of their way. It is not fair to pick just one, but for the sake of a great example, my research mentor in undergrad, Dr Marc Muskavitch, was an absolute saint. While I worked long & hard in those days, I accomplished roughly nothing of value to him. Despite that, he was then and remains to this day a tremendous personal and professional mentor to me. Our mission at Virta is to reverse diabetes in 100 million people by 2025, and I believe we will get there. In 40 years, I see zero reason medical students, both human and cyborg, should not learn about diabetes in the same way I learned about measles and polio. Can you share the ways that technology is changing the experience of going to the doctor. Continuous remote care is absolutely transforming the treatment of chronic diseases here at Virta and elsewhere. It should never have surprised our field that seeing a patient for 15 minutes every 6 months, be that in person or through telemedicine, was totally ineffective when patients need support every 15 minutes every day. Continuous remote care will be even better when supplemented with artificial intelligence. It is hard for any human, even with 1:1 care, to respond to patient questions in real, actionable time, 24 hours a day. AI will not replace true human guidance soon, but it can absolutely respond to simpler questions essentially instantaneously. When patients have a question about their care, support needs to be fast. I am incredibly excited about the prospects for continuous remote care in pediatric chronic disease. Families of children with cerebral palsy and similar diseases tend to become the 24/7/365 unpaid professional caregivers for their children simply because our medical system offers no practical alternatives. Children dependent on support technologies like ventilators can be confined to care facilities for their entire lives. It does not have to be this way. Continuous remote care can help these families lead more normal lives and spend more time playing with their children instead of nursing them. “Ah, but a man’s reach should exceed his grasp, Or what’s a heaven for?” — Robert Browning in Andrea del Sarto. Pulitzer Prize winner Kendrick Lamar.